Some corals are totally reliant on feeding, not photosynthesis... and must have their polyps attended to individually. Hello again Bob, hope this finds you well. I was wondering if you could weigh in on something for me. Over the last few weeks I’ve had issues with a few colonies of my Aussie Acros. In one case a colony of highlighter Acro about 6”x6” started bleaching from the bottom up very slowly. The bleaching was kinda odd because the demarcation line was perfectly uniform across the whole bottom of the colony and worked its way up keeping uniformity. I had to pull it and frag it to save some. So far the frags seem to be ok.
And I run Radions from 7am to 6pm at 90% intensity. My flow is adequate. Several wave makers and power heads. Can you think of anything that I could be missing? Anything I can be testing for? I was wondering if maybe I have low potassium? I don’t have a test kit to check it yet. I will have one in the next couple days. Thank you Bob. Do you have any nutrient feeding suggestions other than overfeeding the tank? Any product you prefer? I read you loud and clear. More food it is. Thank you Bob. Sure will Bob. Thanks again. First of all, with the advice you provided some time ago (http://www.wetwebmedia.com/movaqfaq5.htm, 9/1/14 post), I safely transferred over all my livestock and rocks to their new, roomier home (although now I see what a difference this makes, I now wish my new tank was 240 gallons instead of 240 litres). Although it is still early days (2 weeks), everything survived, is currently alive and my corals are beginning to calcify: my corals, critters and I would thus like to send you our collective gratitude for your help. I wonder if I could trouble you for some more advice? My basic situation is that despite starting regular feeding, my reef-tank setup appears not to be accumulating measurable levels of nitrate and my phosphate has additionally remained low. I guess the available advice (including on WWM) about this appears to be quite conflicting, but would I be right in thinking that even for more autotrophic corals, a low, measurable level of both would be advisable over undetectable levels? My question thus relates to how I should manage nutrients in my tank. It is a 240l tank with 35kg live rock and 0.5in SSB + 80l refugium containing a 4in DSB (total water volume is approximately 285l-295l). 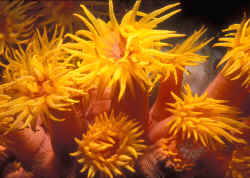 LR is well established with populations of various microfauna, filter feeders and macroalgae (although the latter is not currently growing excessively). The system is 2 months old from the end of cycling right now, but half the rock is from my previous system and at least 9 months old. I think the tank is understocked (6 small captive-bred "SPS" colonies, 5 Lysmata shrimps, 10 trochus? snails and 3 Cerith? snails, no fish) although I have been feeding a home-made meaty ration for my corals/filter feeders every night for the last 10 days. I am running a Tunze 9006 skimmer (rated to 600l) full time but this appears not to skim all that much (no more than 200ml of dark skimmate per week). but the level fell to undetectable within 6 hours and I dared not add more. The nitrate kit appears to be relatively accurate based on testing the diluted stock solution in RO water. Otherwise, the main tank circulation is temporarily reduced to 8000l/hr from 16000l/hr as a snail broke my Vortech mp40 yesterday by going inside it while it was off and jamming the propeller when I started it up (ironically, said snail is completely fine. Grrrr!!!). Lighting is a custom LED build definitely sufficient for at least macroalgae if not corals. I dose using a three part system for Ca, Mg and alkalinity to advisable levels for a reef tank, although may also now add some Kalkwasser occasionally to counteract the high CO2 levels/relatively low pH (8.0-8.1 sometimes, rises on aeration with outside air) in my tank water. So, broadly then, the question: What method(s) would you recommend to maintain a sufficient, yet healthy level of nitrate and phosphate for stony corals, and what levels would you aim for? From my reading, there are a number of different ways to accomplish this (and of course, most marine tanks have the opposite problem), so what is your opinion on the following strategies? 1) Increase feeding (gradually) to a level that generates detectable nitrate. If I do this, would I need to use GFO to remove phosphate if it starts to rise too high (say above 0.1mg/l) compared to the nitrate? 2) Decrease removal of the detritus from the LR and sand beds. Would this set a dangerous precedent in terms of building a nutrient reservoir that may later on cause the tank to crash? 3) Put a small mechanical filter in to catch detritus and deliberately not clean this (although detritus is still removed as normal from the LR and sand bed). 4) Reduce the amount of time the skimmer is running. Would increased levels of DOCs as a result of this be harmful to stony corals? 5) Dose nitrate directly in the form of potassium nitrate. 6) Increase the bioload with more livestock (I guess option 1 would do this by increasing LR microfauna, but I don't know if this is comparable to say, a small fish). 7) Reduce water changes or only change when nutrient levels rise. Would I theoretically be risking micronutrient depletion from the water over time? 8) A combination of some of the above (it's probably this, if anything, but hopefully you've already suggested your preferred methods in the individual feedbacks above). 9) The opposite of all of the above: try to maintain water quality (aim for undetectable nitrate and phosphate), export as much as possible, keep a low bioload and feed minimally to a non-polluting level. In this case, it implies feeding provides sufficient levels of bio-nutrients for corals and microfauna and you don't want additional free inorganics in the water if this can be avoided, since this is the situation in the wild. As before, your response speed is crazy. I guess you're at your computer, but still, I can't even get to my LFS and back in this time. I really appreciate it. As far as I can see, yes, everything that can move is actively out and about at night, and my corals are showing polyp extension/mesenterial filaments particularly on food addition. LOL. A very polite way of saying I am worrying too much about my tank. Thanks for the helpful feedback. I'm really frustrated with my reef. It's been up approaching a year and a half. It's a 120 gallons with about 100 pounds of combined live/previously dried/dead rock. Circulation is about 4000 gph through 4 Koralia pumps plus an Eheim 1260 return from the sump. Two skimmers, an old Tunze 9010 plus a recently added Tunze 9410 are in the 40 gallon sump. Lights are 2 54W T5s ATI Blue Plus, and 2 Hamilton metal halide 175W 14K bulbs. These were all changed for new ones last month. Presumably, according to an old article by Sanjay Joshi on-line, the Hamilton 14K bulbs were the lowest par 175W bulbs tested, so I thought they would be perfect for a predominantly lower-light LPS tank. I keep salinity at 1.026. Calcium last tested at 400 ppm, and kH I try to keep at 9, though it does tend to drop quickly to 7 or so if |I don't add alkalinity a couple times a week, even though I have an ATO with saturated kalk that I added as a result of the kH dropping. I have for these which apparently don't detect low levels well. I had my local aquarium store repeat these and they got the same results, but they also use the same tests! Last 3 months or so I added a very small amount of carbon and Phosguard (because of the nuisance algae) into separate media bags in the sump...about a half cup of each. I plan to gradually increase this. Never used these up until very recently. Magnesium is at 1250 when tested a couple of weeks ago. There are definitely some scattered tufts of hair algae in my tank, some Valonia, but nothing major. I pluck them out regularly. Used to have some red Cyano but not for several months now. For the past month and a half I've had a stubborn brown algae on the substrate which may be Dinoflagellates, though I'm not a 100% sure. I suction it out but it returns within a day or so. However, this is only the past month and a half, and my problem has been happening for more than a year. I vacuum the substrate weekly, and do an 8% water change at the same time. New water is made through a multi-stage RO system purchased specifically with my chloramine-treated city water in mind...with the additional GAC stage. The carbon stages in it are only about 3-4 months old. The membrane still seems good as the tds is always under 8 ppm. I use Instant Ocean salt. Used Kent for some time before. I have only 3 fish, 2 Gobies and a Royal Gramma. One pistol shrimp. You can see from my pictures I have about 15 corals. Most are LPS, several Euphyllias, with some Favia, Favites, Candy Cane, Lobos, and a large red Trachy. There are also a couple Monti Caps. All are fairly well spaced out. I feed a cube of mysis to all the LPS at least once per week, sometimes more often. and quarantined for 2-3 weeks until I feel comfortable there are no pests. Many looked great for several months, but in time start to show slow tissue necrosis and recession. Sometimes the receding margin is clean looking (lobo), sometimes there's a whitish mucus-like band (the favia/favites), other times there is obvious necrotic tissue that starts to peel away and flop around in the current before disappearing (euphyllia). The appearance of the damaged area seems to depend on which type of coral it is. In time the feeding response weakens. It's affecting more than half the corals to a greater or lesser extent. Sometimes it seems to slow down, then start again. Recently my candy cane coral which looked great for months has started to lose heads...seemingly without reason. My receding torch coral has some tiny white copepods living on it, but the other sick corals don't show any critters at all, so I'm not sure on their impact or significance. I think it's important to point out that there are a few corals that seem impervious to whatever is going on. For example the large Euphyllia Divisa on the left, and the Trachyphyllia have never shown any problems and continue to look great....so far! Also the 2 Monti Caps have grown considerably after starting out as tiny frags. Over-all I have only lost one coral, a Plerogyra, and that was many months ago. So the decline happens quite slowly, but it's little comfort as the corals are clearly declining, and I have certainly lost entire heads of a torch coral, a candy cane, and probably 80% of the tissue on one Favites. Most recently both my Lobos are starting to show some recession, and one shows reduced feeding response. One has been with me about 9 months, and other about 6. For some time I thought it was the low kH, but have been on top of that for some months now. Thought lights too strong and reduced halides to only 3-4 hours and 7 hrs for the T5s for some months but saw no improvement. Then thought maybe not enough light so I increased T5 to 10 hours per day, and 6 for metal halides. Maybe I should increase it further? It's just that towards the end of this photo-period some of the coralstart to show signs of closing up as if they've had enough! As I said above, my understanding is these are quite mild as far as metal halides go...from what I remember from that Joshi article it was about 30 ppfd at like 20 inches...I know the details make a difference, but I can't remember. I don`t have a par meter. However, I placed one of my Torch corals and Favites into a 10 gallon "hospital" tank under a different single 150W 10K MH for the last 2 months or so, and don't see any significant changes...at first thought the recession stopped, but now see some progression. I'm thinking a possibility is maybe some Chloramines getting through my RO system? But then that would damage the RO membrane and increase the TDS, which has remained consistently low. Maybe a disease, but would that kill so slowly, and so many different types of coral? Based on the photos and description, is it possible to tell if this is a water quality, lighting, or an infection issue? I may try iodine dipping some of the corals soon. Also want to try the Bayer insecticide dip I read many using successfully on-line...only thing is that the Bayer insecticide recommended is not available in Canada, I believe because there are some environmental concerns with one of the active ingredients. Not sure where to go from here, and I feel that I need to do something ASAP as many of my corals are still potentially saveable, but not for long. Thanks for reading this loooong letter, but I didn't want to leave out any possibleclues. Appreciate any inputyou can provide. Hi Bob...thanks for getting back to me, but you lost me. Which "above notes" do you mean? That mysids are insufficient food? I assure you I have read everything on WWM regarding possible causes of my problems. As far as feeding mysis, my understanding is these are the most nutritious option...much better than brine shrimp. I have coral pellets but my corals don't seem to like them, and usually regurgitate them so I stopped trying. The mysids they seem to like. Many aquarists don't feed their corals anything at all and they do well. In a tank I kept some years ago I didn't feed my Euphyllia a thing and it grew huge...whereas the ones I have now are receding. So, I'm not following your point, sorry. Were my photo files too large? If so I apologize, I re-sized them. I went to my local fish store yesterday and got the urge to possibly purchase some Acro aquacultured SPS frags or some LPS hammer coral frags ( I prefer aquacultured since they don't go tearing up reefs). 1 is 8000K/453). If my tank can handle these corals would placement be high? or start them low and move them up? also I have a MP10 wave maker in the tank on reef crest mode, If I'm not mistaken the hammer coral would not like the heavy flow but the Acro would? and I would think it would just pollute my tank. What would you suggest to feed corals? Cyclopeeze maybe? and how often? I think this outline is great! importance of providing nutritional supplementation to these captive creatures, and which food sources are of value to them. I am so glad you sent this to me, Bob. I look forward to reading the article in it's formal state on WWM. Tubastraea Feeding follow-up 7 April 2005 Hello one more time MacL <Hey!> How do I know when my coral has finished eating? (I know kind of a silly question). Not silly whatsoever, I generally judge it done when all the food disappears in the cap but I have a friend who leaves him on for an hour and no longer. His corals are thriving as well. I think you can safely judge by how fast they eat and by how they respond.> But I want to do this right. Thanks again!! !